Longtime faculty member gives back to the College of Geosciences. Dr. Richard Orville is no stranger to service in higher education, it has been part of his life for almost 60 years – 26 of them right here at Texas A&M. But when he glanced at the donor plaque in the lobby of the O&M Building last year, something inspired him to do more. Seeing the name of Kate Miller, former Dean of the College of Geosciences, gave him inspiration. “When I saw Kate and what she had done, that’s when I made a decision to give,” said Orville. The gift agreement establishes the Dr. Richard and Barbara Orville Endowed Scholarship, which supports students pursuing an undergraduate degree in the College of Geosciences. Orville joined the College of Geosciences at Texas A&M in 1991, and currently serves as Research Professor and Professor Emeritus in the Department of Atmospheric Sciences. 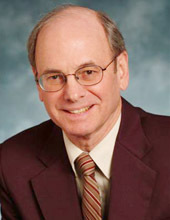 He is active in national atmospheric science programs ­– having served 4 years on the Council of the American Geophysical Union (AGU) as atmospheric sciences section president and president-elect, 12 years on the Council of the American Meteorological Society (AMS) as Commissioner of Education and Commissioner of Publications, and 6 years as a member of the University Corporation for Atmospheric Research (UCAR) Board. Orville wants to see a greater number of students get into geosciences. More specifically, he hopes his gift will contribute to recruiting more students interested in atmospheric sciences. “It can improve the number of students that are majoring in atmospheric sciences. And to do that, in some cases, just requires scholarship assistance. They’re not going into atmospheric sciences for the money. But if the funding isn’t there to assist them, they may not do it at all,” he explained. This is a particularly important area for Orville. When asked about what he would say to encourage others on the importance of giving to geosciences, his answer was clear: “Climate change – which is going to affect all of us. Your children, your grandchildren, and beyond that. We can argue about what’s causing it – but the fact is, it is occurring,” he said. Orville is thankful for the opportunity to serve as a faculty member in the College of Geosciences, and hopes that his decision to give something back will inspire others to do so as well. Richard and Barbara Orville saw a need, and stepped up to ensure that future students will have scholarship opportunities in the College of Geosciences at Texas A&M. Thanks to the Orvilles, there will be more. Dr. Richard Orville, Research Professor and Professor Emeritus in the Department of Atmospheric Sciences.